This Christmas, my theme is re-purposing. I suppose that my actual theme is "Let It Snow" (the vintage ski lodge version). But there's also an underlying theme going on in my life and my holiday decorating this year and it's all about re-purposing. Before I talk about that, however, I wanted to show you this Before and During photo of the living room. I realize that most people would call this a "Before and After" photo but given that the main portion of the renovation at the French farmhouse hasn't even begun, I'm calling the photo on the right the "during" phase. I thought that I'd show you how the living room looked in August. Sometimes I forget that we're still in Phase 1 of this project. I forget how very different things look today than they did just over three months ago when we moved to the farmhouse. I forget that the cedar paneling above the fireplace was painted green....and pink....and ivory. Or that it took three days to strip. I'm probably suppressing those memories. I think that I read somewhere that people tend to do that with traumatic events. 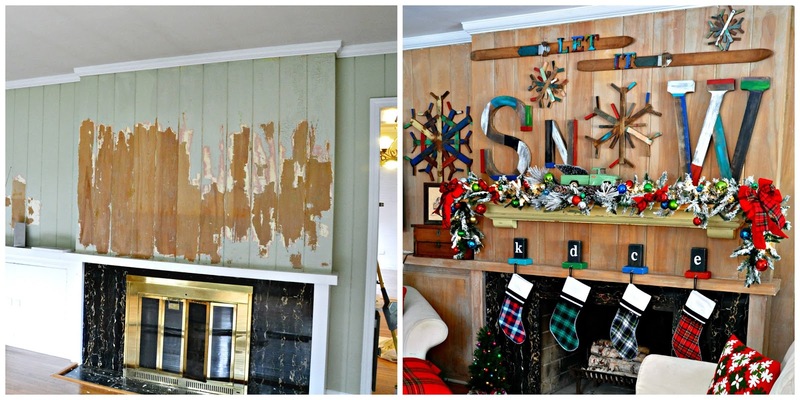 I also forget that there really wasn't really a mantel above the fireplace. It was just a narrow little ledge above a brass fireplace screen that fell completely onto the floor (and my foot) when I tried to open the doors. I'm suppressing that memory, too. 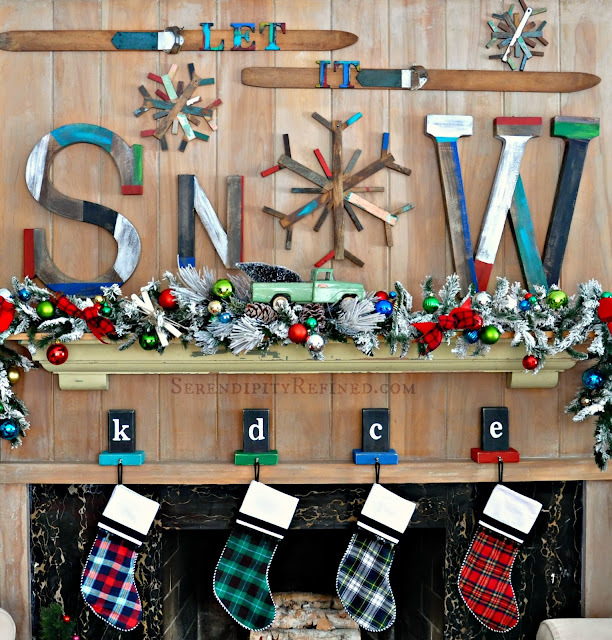 Today, there's a mantel. I suppose that technically, it's a reclaimed shelf with a piece of 1 x 10 on top that's acting as a mantel...for now. The shelf will have another life next Christmas. It will be re-purposed again as a shelf in my new master bathroom. 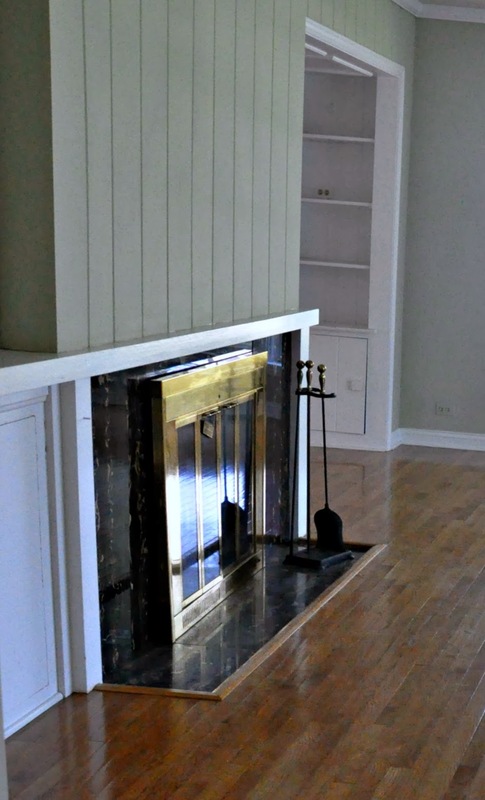 Oh, and the room where this fireplace is located...the one that's currently our living room? It is going to (hopefully) be re-purposed into our new dining room by next year at this time. Confusing, isn't it?! The reclaimed wood snowflakes and vintage ski's? Well, they'll probably find a home in my new studio.... which is being re-purposed from the space that is currently the garage. Re-purposing found objects is one of my favorite things to do. All it takes is a little imagination. 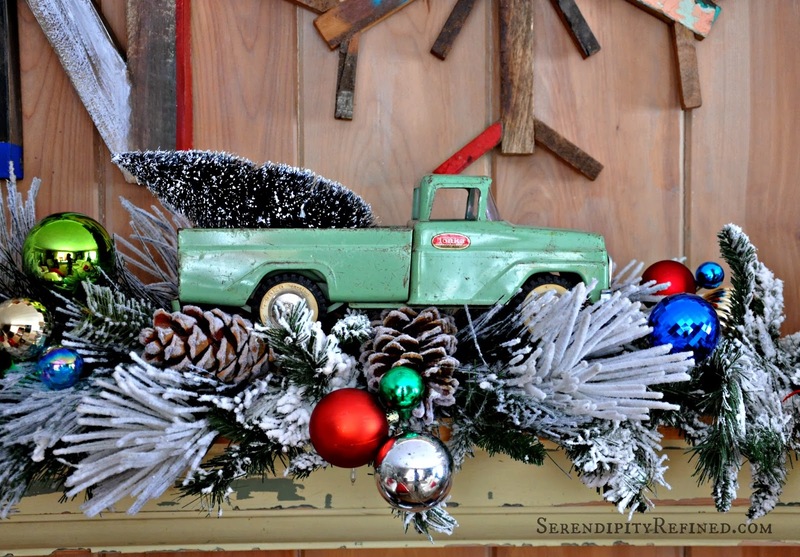 In fact, almost everything that I used to create this year's mantel has had a prior life and a different purpose. 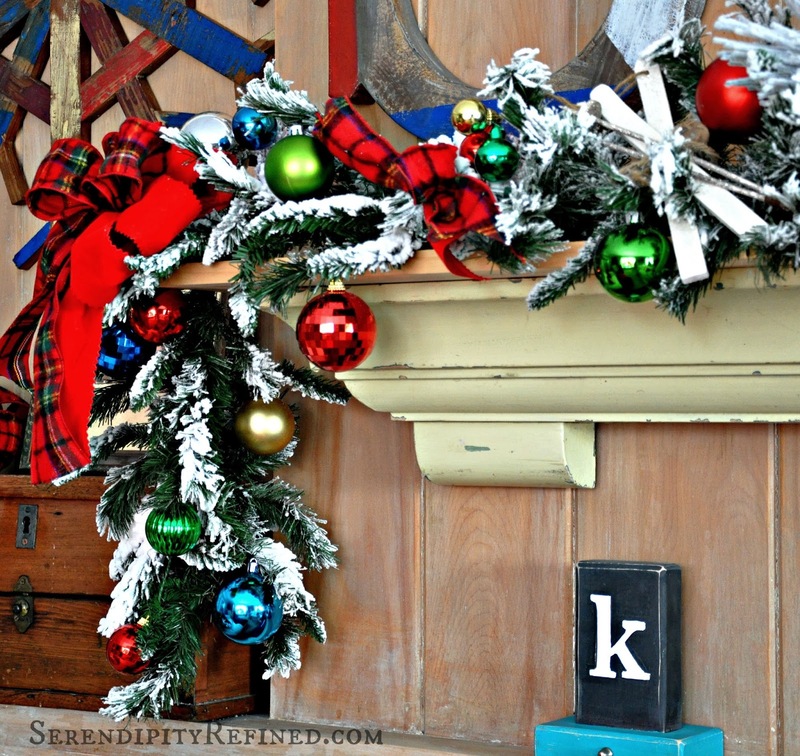 The garland was from my 2012 white woodland winter mantel (here). The bows were from my 2012 Christmas tree. Do you remember that tree? It was the 12 foot tall one...with the plaid cardboard star tree top. I have to admit, I won't miss climbing a step ladder to put the top on our tree this year. 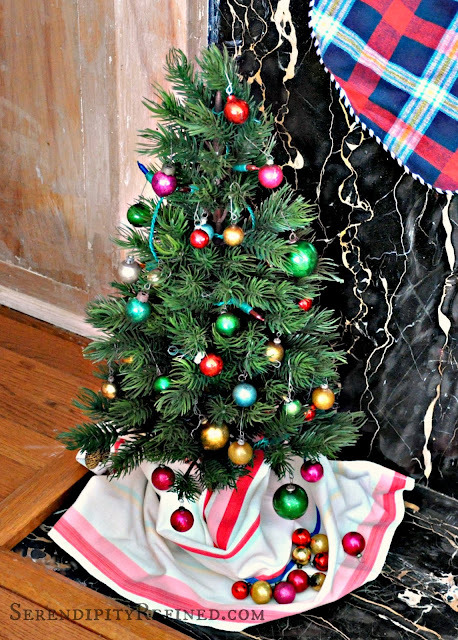 The colored plastic ornaments were re-purposed from the Grinch Christmas themed outdoor decorations that I made five or six years ago. Yes, I know, it's sad that I found an entire huge bin full of plastic ornaments that I had completely forgotten about in the back of the closet when we moved. I swear I'm not a hoarder....I'm a saver. Don't judge me. We're not talking about dressers today. 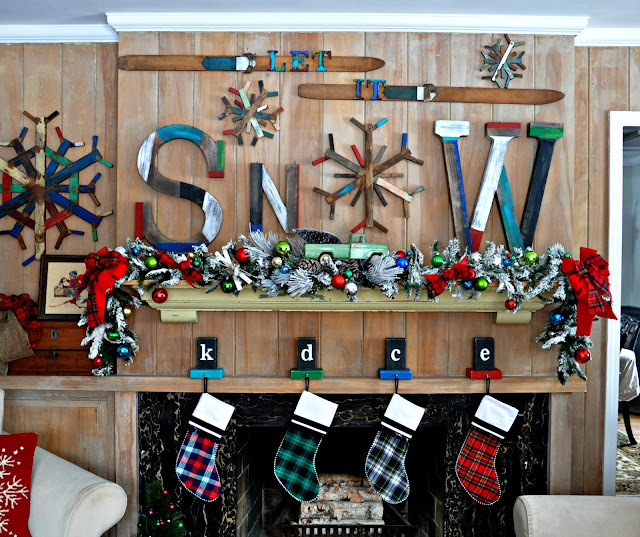 Today we're going to discuss the fact that the only truly "brand new" part of this mantel was the letters "S, N, and W." They are cardboard, purchased at JoAnn fabric and painted to look like wood using craft paint and paraffin wax. Other than those three letters, everything else is either re-purposed, hand made, or re-used. 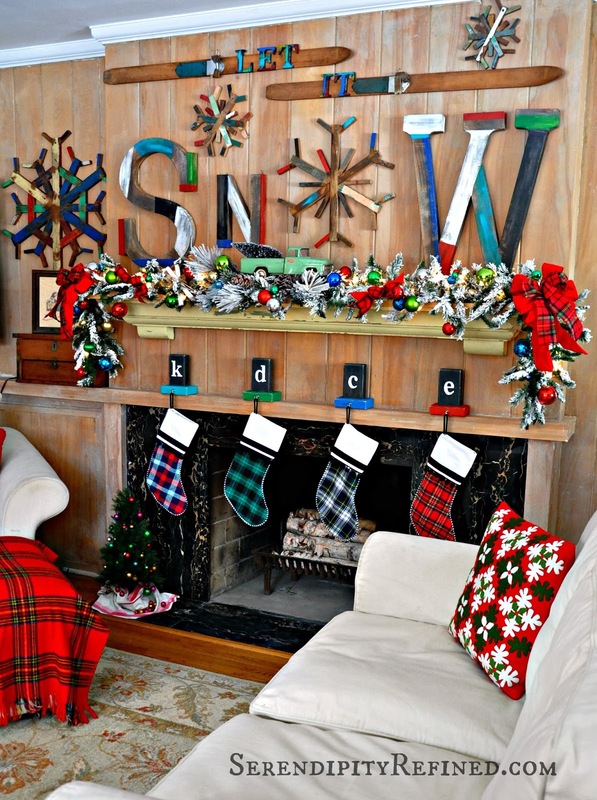 I made the 2 x 4 stocking holders (HERE) out of wood from the scrap bin at Home Depot and the stockings are made from flannel shirting using my free stocking pattern HERE. The tiny tree with vintage ornaments previously belonged to my Uncle. The tree skirt is a re-purposed vintage kitchen towel. Of course, the toy truck had another life some time in the 1960's. I suspect that the prior owner loved it almost as much as I do but it was probably loved outdoors rather than in the middle of the family's Christmas Mantel. 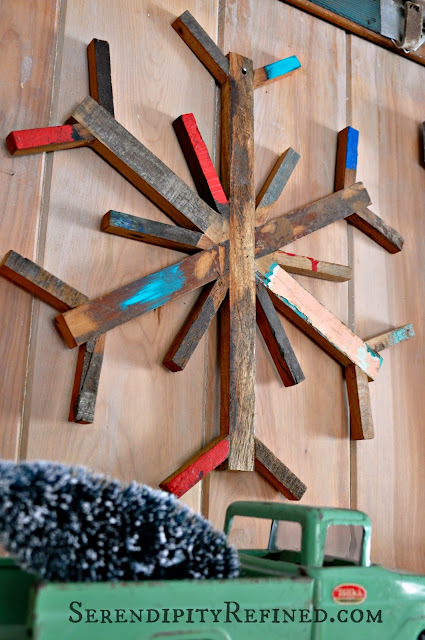 Thanks for taking the time out of your busy December to spend a few minutes with me and to look at my crazy, vintage, rustic, ski lodge mantel. 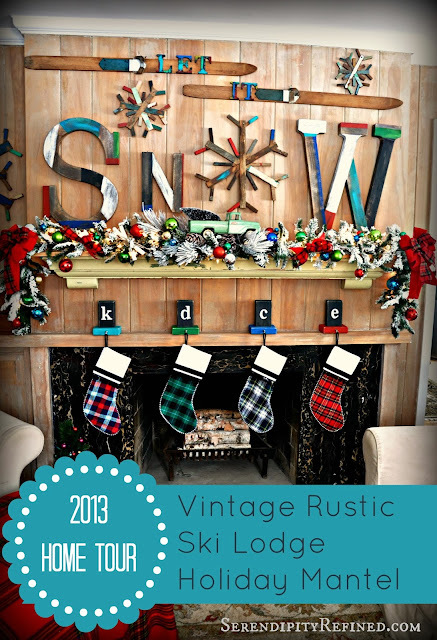 I hope that it'll inspire you to find a way to reuse or re-purpose a few things around your home. Did I mention that I'm re-purposing my bedroom into a new kitchen? No? We'll talk about that soon. In the mean time, Let it snow! Wait...Let it snow right after I finish my Christmas shopping!